Have You Entered Weevil of The Week Yet? What’s your favourite Bin Food and why? What’s your favourite sport and why? Where’s your favourite Bin hangout and why? What’s your favourite thing to do in the Bin? What’s your favourite game in the Bin? If you win Weevil of The Week, there’s two Bin-tastic rewards! Firstly, you’ll be as big as Big Weevil for a whole week and gain a trophy, which you can keep forever, to show off to your weevily Bin Buddies! A new Weevil of The Week is picked each week – just imagine all the fame you would gain on Bin Weevils! What are you waiting for? Send in your entry now and hopefully you may just win! Starting this Friday, we will be doing a weekly interview with the Weevil of The Week winner and it’ll be published on here! Wow, it’s the first radio show of the month, and it was a cracker! We even got a special appearance from Big Weevil and Unicron7022, the two good Bin Weevils HQ Staff Members. As always, there are pictures towards the bottom. Remember to comment if you’re in the photo of Big Weevil and Unicron7022! As you may know, I am here every Saturday and Sunday posting about the Radio. 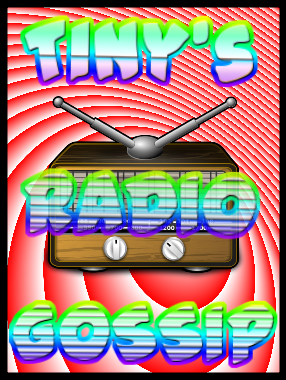 As you may can see, on the widgets is my image, to represent the Radio Show Gossip! Today we have…. You May re-blog but do not copy this post as it is my post! Many thanks, Tiny! This Weeks 500 Mulch code is…..MULCHISLAND500. Remember it only works for today. so log on in-game and go to Labs Lab or scroll down and click secret code and put in the code above! Bin Weevils – The Great Bin Weevils! 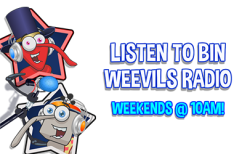 Last Chance: This weekend is your last chance to get your radio reviews into the Radio website so it can be read out on the Bin Weevils Radio Show. Head down to the funkids website and then go to the Bin Weevils Section and follow on from there. Shout Outs: Are you unsure on where to get a shout from don’t worry, your just a few steps away from making your own shout-out to be read out from Scribbles or Bex. Click here and you can get your own shout-out to be read out! What did you like most about the awesome Bin Weevils show? Comment below with your reply and we will get back to you as soon as we can. Make sure you pick up your FREE Radio at the shopping mall today and listen again next weekend! Guess What hf556 has Been Awarded… A Gold Bin Garden Trophy! Don’t I just have some weevily awesome news for you? I had just logged into Bin Weevils, when I noticed my buddy messages box was flashing! I opened it, wondering who it would be from, when I noticed it was a message from Big Weevil, I had won a Bin Garden Trophy! I clicked the message and it said I’ve received a GOLD!! I’m literally SPEACHLESS at the moment! I earned a Silver Bin Garden Trophy last month and now a Gold Bin Garden Trophy! What next? Platinum? Will I get a Gold Bin Nest Trophy? Let’s hope so! If I do, I will be sure to post it on here. Have a good Monday and remember to keep weevilin’ on! Did you wear your Pirate Hat? Shiver me timbers! I’ve been wearing your Pirate hat this week, you would have received a prize this afternoon! I logged on moments to discover that my message box was flashing, it was a message from Big Weevil! I clicked it to find that I’ve received my Pirate prize for wearing my Pirate hat all week! I can reveal that you will gain a parrot nest item, isn’t that fantastic? Did you know? The Pirate Party is still on, jump on the speedboat at Mulch Island and explore Wink’s Pirate Ship! There’s games to play, prizes up for grabs and Bin-tastic areas to explore, it’s all waiting for you at the party! Win an Exclusive Christmas Item! Wear Your elf Hat! Lucky for me, I had over 700 Dosh worth of Hat vouchers, so it didn’t cost me anything to buy an elf hat for my Bin Weevil! After reading the message from Big Weevil, I went into my Christmas room, opened up my chest and my prize was there! Stay tuned for more Christmas posts, which will be coming soon! Please click here to read the post about sending in your weevily Christmas rooms! A Reward From Big Weevil: Special Pack of Bin Pet Goodies! I just logged into Bin Weevils when I noticed I had a buddy message. I thought it would be from one of my Bin Buddies, but It was from Big Weevil! I thought that was weird because I get my Dosh salary on the 12th but it turns out Big Weevil had decided to reward me with a special pack of bin pet goodies! I thought Big Weevil meant like a packed of food for my bin pet, but when I opened my chest, my jaws dropped. Please note: Big Weevil gave me one of each of the items below. The one that has a two on means I already had one.